UNITED NATIONS, Jan 18 2018 (IPS) - A year into his position, the United Nations Secretary-General António Guterres said that peace remains elusive and that renewed action must be taken in 2018 to set the world on track for a better future. Around the world, challenges such as conflicts and climate change have deepened while new dangers have emerged with the threat of nuclear catastrophe and the rise in nationalism and xenophobia. “In fundamental ways, the world has gone in reverse,” said Guterres to the General Assembly. Among the major concerns is the ongoing and heightened nuclear tensions. Guterres noted that there are small signs of hope, including North Korea’s participation in the upcoming winter Olympics as well as the reopening of inter-Korean communication channels. “War is avoidable—what I’m worried is that I’m not yet sure peace is guaranteed, and that is why we are so strongly engaged,” he said. Despite UN sanctions, North Korean leader Kim Jong Un has refused to surrender the country’s development and stockpile of nuclear missiles. During a meeting in Canada, United States’ officials warned of military action if the Northeast Asian nation does not negotiate. “It is time to talk, but they have to take the step to say they want to talk,” U.S. Secretary of State Rex Tillerson told foreign ministers. A recently released nuclear strategy also outlines the U.S. administration’s proposal to expand its nuclear arsenal in response to Russian and Chinese military threats which may only sustain global tensions. Guterres has also pinpointed migration and refugee protection as priorities for the year. Though arrivals have dropped, refugees and migrants from Honduras to Myanmar still embark on dangerous journeys in search of economic opportunity or even just safety. However, they are still often met with hostility. “We need to have mutual respect with all people in the world. In particular, migration is a positive aspect—the respect for migrants and diversity is a fundamental pillar of the UN and it will be a fundamental pillar of the actions of the Secretary-General,” Guterres said. The UN Global Compact for Migration is set to be adopted later this year after months of negotiations. The U.S. however has since withdrawn from the compact and is seemingly increasingly abandoning its commitments to migrants and refugees. Most recently, U.S. President Donald Trump allegedly made offensive comments about immigrants from Caribbean and African nations. The African Group of UN Ambassadors issued a statement condemning the “outrageous, racist, and xenophobic remarks” and demanded an apology. Guterres expressed particular concern about U.S. cuts to the UN agency for Palestinian refugees (UNRWA) which has served more than five million registered refugees for almost 70 years. “UNRWA is providing vital services to the Palestinian refugee population…those services are extremely important not only for the wellbeing of these populations—and there is a serious humanitarian concern here—but also it is an important factor of stability,” he said. Just a day after the Secretary-General’s briefing, the U.S. administration announced that it will cut over half of its planned funding to the agency. “Cutting aid to innocent refugee children due to political disagreements among well-fed grown men and women is a really bad politicization of humanitarian aid,” he said in a tweet. 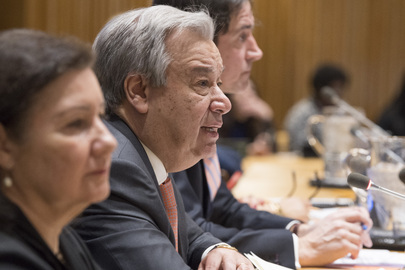 In light of the range of challenges, Guterres called for bold leadership in the world. “We need less hatred, more dialogue, and deeper international cooperation. With unity in 2018, we can make this pivotal year that sets the world on a better course,” he concluded. Why do nations war against each other? It all starts in the heart of man. If the heart is clean then it does not war against itself internally. The soul of a man is the capacity for evil or good, and thence the state of the heart and the outflow from within. Pride, hate, greed, humility, empathy… The heart is a minefield of emotions and the expression of man’s persona results in his world and of those in proximal.